On the 12th of July, Isabel turned four years old. 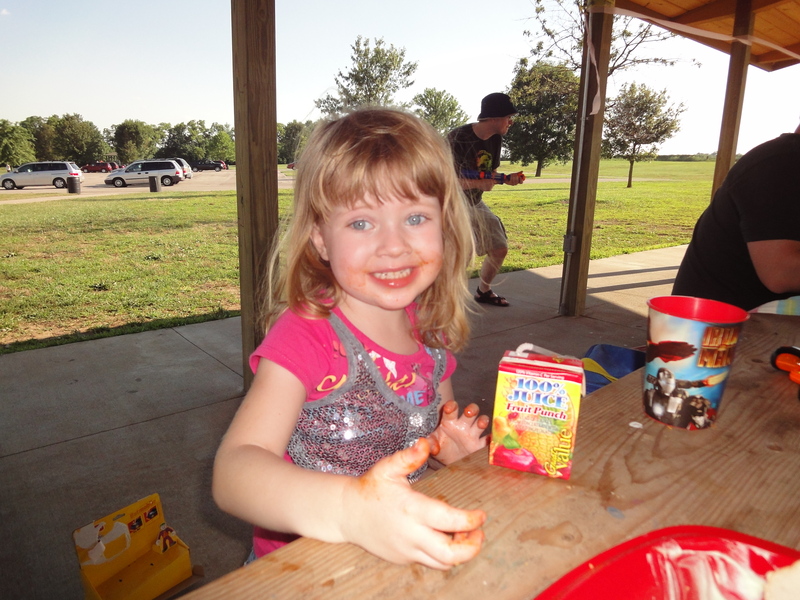 Isn’t she cute covered in ketchup? Isabel got a birthday phone call from “Grandma Liz”, Chris’s mom, that struck me as incredibly ironic. She had just returned from “The Twelfth” parades. It’s the Protestant Northern Irish national holiday, celebrating the victory of Protestant King William of Orange over Catholic King James II. The Protestants in Chris’s hometown celebrate by burning an effigy of Robert Lundy, who aided the Catholics in the war, in giant bonfires. Chris’s family was thrilled that Isabel was born on this day. Our little Catholic girl. She’s been baptized Catholic. She crosses herself when she prays. She hardly mentions Jesus, but she wants to include Mary. She picks out prayer cards and crucifixes for herself at Catholic bookstores, and already believes and takes great comfort in the communion of saints. It’s as if God, in His infinite humor, looked at this day celebrated in Protestants in Northern Ireland and said in response, “This day is what I make it.” He took a Protestant from Northern Ireland, made him Catholic, made his family Catholic, and brought a little Catholic girl into the world on this day. Coincidence? Or Divine Irony? This entry was posted on Thursday, July 22nd, 2010 at 7:32 pm and is filed under my story. You can follow any responses to this entry through the RSS 2.0 feed. You can leave a response, or trackback from your own site. By the way, today it was huge battles over refusal to pick things up. Perhaps I need to box up a bunch of crap so she appreciates better that which she has? Regardless, it was an early bedtime and we’re looking forward to a better day tomorrow. Endless battle after endless battle! Sometimes I wonder if it’s worth it. I know she needs a nap. But since it takes a couple hours out of each day, full of fights and frustrations, and she only sleeps 20% of the time, is there much benefit? But that’s what we’re here for! To save them from themselves. LOL… I just realized you can see Chris lurking with a water gun in the background of that picture . He was quite the menace at her party. LOL!!! How did I miss that obviously sinister character over her shoulder?!! !